THIS HOTEL IS 100PCT NON SMOKING At the Hampton Inn - Suites Houston-Bush Intercontinental Airport Texas hotel on JFK Boulevard just south of Houston*s Bush Intercontinental Airport in Texas you will discover a hotel where your comfort and personal needs are truly given 1 priority. The Hampton Inn - Suites Houston-Bush Intercontinental Airport Texas hotel provides complimentary On the House hot breakfast served every morning between 6am and 10am in the lounge area fresh coffee tea and juice in the lobby 24 hours a day a complimentary copy of USA Today Monday through Friday and a Manager*s Reception Monday through Thursday evenings between 530pm and 7pm. At the Hampton Inn - Suites Houston-Bush Intercontinental Airport hotel in Texas we look to make our guests feel at home. Beautiful new Cloud 9 Beds at the Hampton Inn - Suites Houston-Bush Intercontinental Airport hotel in Texas welcome our guests when they enter their room and we provide a wide choice of TV channels ranging from 36 free channels including the golf channel to more than 100 pay-per-view movies. We provide both hard wired and wireless high-speed internet access in all guest rooms and wireless high-speed internet access in all public areas. 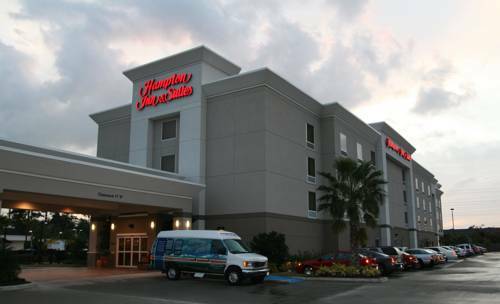 We love having you here at the Hampton Inn - Suites Houston-Bush Intercontinental Airport hotel in Texas. all reservations must be cancelled by 4pm host time unless deposit required. if this reservation has been made electronically please cancel it electronically to avoid confusion and a no show bill.